In the early morning I start my fourteen hour train ride back to the heart of Japan. I have to change trains several times, but all trains I have taken so far were on time. Punctual to the minute. 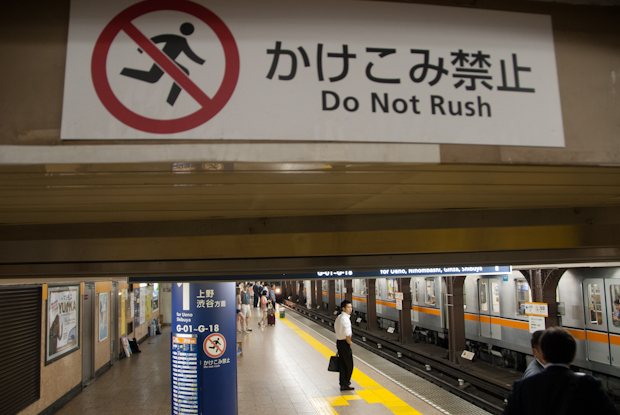 After one hour the train slows down to walking speed. After another half hour I start to worry. There is an announcement in Japanese I do not understand. Everybody in the train remains quiet. There is no way I can make my connecting train. So I address the conductor. I show him the ticket for the train I have to catch. He tells me that he does not speak English, bows three times and walks away. From that moment on he avoids looking at me and ignores any attempt I make to get some information. The system has broken down. That is his way to deal with it. I am on my own. When we finally arrive two hours late another passenger signals me to follow him. He does not speak English either, but he obviously got what the conductor did not or did not want to. He shows me the way to the ticket office, and explains that I have to change my tickets. Thank you, whoever you are! I have to change my tickets because I missed the train. It’s not my fault. Does not matter. Follow the procedure. Behind me the queue is growing fast. Thanks to my guardian angel I am in the first quarter of the queue. I only have to stand in line for half an hour. Everybody is calm. No curses. No complaints. No reaction whatever from the railway company. Business as usual. I have seen much more pragmatic responses in different parts of the world. The connecting train is packed to the limit. I stand in the aisle, realizing that I am taller than about 95% of the people standing in this coach. The train passes through one of the longest tunnels in the world, connecting Hokkaido to Honshu. Somewhere under the ocean an asian looking woman curses in English. Everybody else remains silent. A situation like this must put some kind of pressure on people. If so, they do not show it. It sure puts pressure on me. I spoke to some people who work in Japan. It appears that people here have less holidays than I am used to, and are expected not to take them. Expect when everyone is on holiday. I lived in a typical japanese apartment. It was family size I was told. It appeared rather small to me. There seems to be an intricate net of social rules in place. Some complex and almost incomprehensible for someone not born in Japan. Some pretty simple. As a foreigner I broke quiet a few. Most unintentional. Some because they appeared ridiculous at the time. Some because it made life so much easier. I guess I have broken even more I am not aware of. As I am not part of this society I cannot say how much pressure there really is. I notice the ways to put pressure off people. The omnipresent convenience infrastructure, the extreme politeness and patience. People are very friendly and helpful in general. In Japan people seem to deal with pressure in their own private ways. 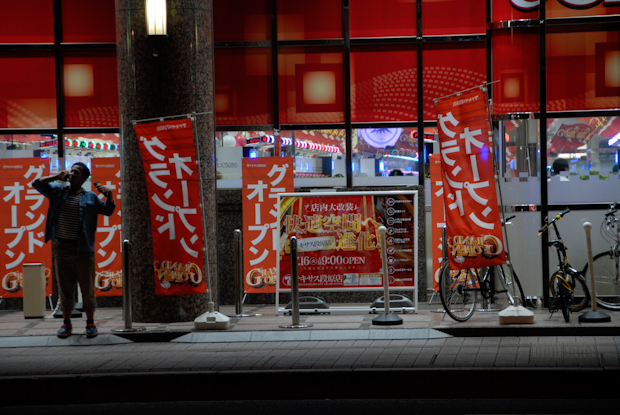 Some ways appear rather strange to me, like the deafening roar of the Pachinko halls. I entered one and left after five seconds. I was afraid it could do permanent damage to my hearing. With the last train that runs on this day I arrive in Nagano.